As always, the booksellers and Publishers Association of South India will organize a book fair that lasts for about two weeks from January 4th ends on January 20. With each year the number of books lovers and the stalls are increasing rapidly. This year too, the expectation is too high for all. The First Madras (Chennai) Book Fair was held in the year 1977 from December 14 to 24 organized by the Booksellers and Publishers Association of South India. The First Book Fair had 22 stalls and was held at the Madras-i-Azam school due to the initiative of K.V Mathew of B.I Publications. At the 12 Madras Fair held from December 22,1989 to January 1, 1990, Tamil Translation of WHO Publication was put on Sale. Following the Success of Madras Book Stall, similar stalls were started at Udagamandalam, Thiruvananthapuram, Pondicherry, Thiruchirapalli. The Book Fair celebrated its Silver Jubilee in 2002 and the fair was held for 15 days instead of 11 days. In the year 2007, due to traffic congestion and the need for more space, the Venue was changed to St George School in Kilpauk. All the People are welcomed to the Fair. 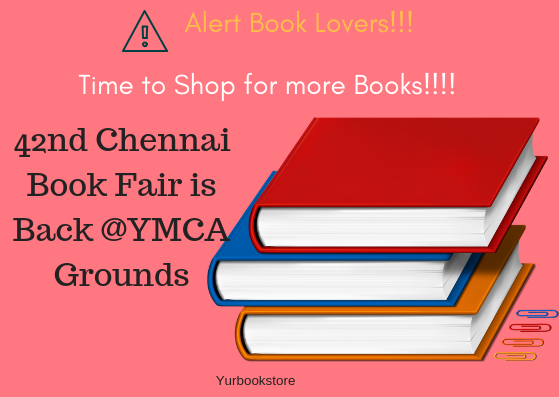 Buy all your desired books and enjoy the largest Book in the country"The Chennai Book Fair"
Thus the most awaited Book Fair is coming and doesn't forget your book your tickets in advance.